Regal Court is a beautiful bungalow apartment complex on Michigan Street just north of Olive Avenue. Build in 1927 by the prominent Redlands real estate and fire insurance salesman Melvin L. Hooper. He originally sought capital from outside sources but no one was interested. After 5 years he was able to save the $50,000 needed to build his Regal Court. They were built as rentals and have remained rentals for the past 80 years. Regal Court contains ten double units and six single units. It is a U shaped court with single storied units to the long sides and a two story building to the rear. Each unit is similar on the outside, but subtle differences were built into the interiors. Bright white exterior walls contrast with the red terra cotta tile awnings over the front door and windows. “Window space in the court is far beyond the ordinary. Every unit is lit from four sides and when darkness falls every side of every section will be artistically illuminated. In fact, it will pay visitors to make an evening trip to Michigan Street just to see how lighting should be carried out.” Centered high on the 2 story unit, near the roofline, is the crest of Regal Court. Below that the Regal Court name spelled out in neon. The 1927 article also describes the gardens: “The lawns have been laid by J.F. Gaghan with the best grass seed obtainable, and T.Somers himself laid in the sprinkler system for all garden services.” Today the lawns and shrubbery remain as attractive as ever. 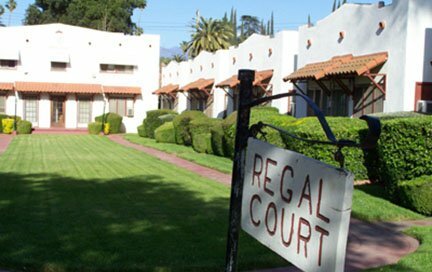 Like a snap shot in time, the Regal Courts have changed little in the last 80 years. The reporter in 1927 felt that, “Mr. Hooper is to be commended on his sprit in giving Redlands such a court.” The Redlands Area Historical Society commends Mr. Sansone for his care and attention in maintaining these incredible bungalows. Researched and written by Walker Price.